Marian Chitimus is proud to be part of the team delivering high-quality homes to a new community in Bedfordshire, after spending all of his working life in the house-building industry. Originally from Romania, Marian has carried out virtually every role on a construction site, including labourer, foreman, forklift driver, painter and decorator, electrician and plumber. He is now utilising his extensive knowledge and experience as the assistant site manager at Bovis Homes' Froghall Fields location on the edge of Flitwick. “I definitely think it helps that I have done a wide variety of jobs on different construction sites since I came to live in the UK,” explained Marian. “If a customer has a query during the build process, I'm normally able to answer it on the spot and give them a very good idea of what's involved and how long it will take. “I have spent the whole of my working life in construction and I'm very passionate about making sure all the work is done properly. Marian paid his first visit to the UK in 2005, while still at high school, to attend his brother Bogdan's wedding. He enjoyed the experience so much that he returned on several occasions over the next six years, before settling in England permanently in 2011 after finishing university. 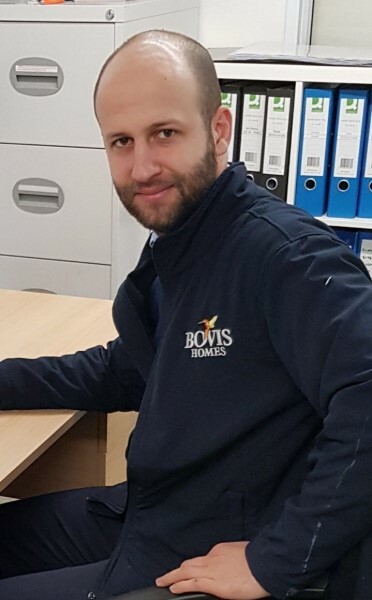 Marian, who lives in Rushden, joined the Bovis Homes team at Froghall Fields about 12 months ago and he is enjoying working alongside site manager Jamie Reynolds. Just a mile from the town centre, Froghall Fields is close to open countryside and only a few minutes' drive from schools and leisure and health facilities, while junction 12 of the M1 is just five miles away. “I'm enjoying coming to work every day,” said Marian. “We have a good relationship with the sales team and our sub-contractors on site. “When we're on site, checking that the work meets our highest standards, it's always nice to be invited in for a cup of tea by new home owners.